Overview Acquired flatfoot deformity caused by dysfunction of the posterior tibial tendon is a common clinical problem. Treatment, which depends on the severity of the symptoms and the stage of the disease, includes non-operative options, such as rest, administration of anti-inflammatory medication, and immobilization, as well as operative options, such as tendon transfer, calcaneal osteotomy, and several methods of arthrodesis. Causes There are multiple factors contributing to the development of this problem. Damage to the nerves, ligaments, and/or tendons of the foot can cause subluxation (partial dislocation) of the subtalar or talonavicular joints. Bone fracture is a possible cause. 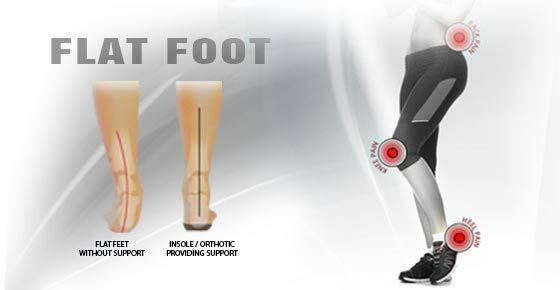 The resulting joint deformity from any of these problems can lead to adult-acquired flatfoot deformity. Dysfunction of the posterior tibial tendon has always been linked with adult-acquired flatfoot deformity (AAFD). The loss of active and passive pull of the tendon alters the normal biomechanics of the foot and ankle. The reasons for this can be many and varied as well. Diabetes, high blood pressure, and prolonged use of steroids are some of the more common causes of adult-acquired flatfoot deformity (AAFD) brought on by impairment of the posterior tibialis tendon. Overstretching or rupture of the tendon results in tendon and muscle imbalance in the foot leading to adult-acquired flatfoot deformity (AAFD). Rheumatoid arthritis is one of the more common causes. About half of all adults with this type of arthritis will develop adult flatfoot deformity over time. In such cases, the condition is gradual and progressive. Obesity has been linked with this condition. Loss of blood supply for any reason in the area of the posterior tibialis tendon is another factor. Other possible causes include bone fracture or dislocation, a torn or stretched tendon, or a neurologic condition causing weakness. Symptoms Patients often experience pain and/or deformity at the ankle or hindfoot. When the posterior tibial tendon does not work properly, a number of changes can occur to the foot and ankle. In the earlier stages, symptoms often include pain and tenderness along the posterior tibial tendon behind the inside of the ankle. As the tendon progressively fails, deformity of the foot and ankle may occur. This deformity can include progressive flattening of the arch, shifting of the heel so that it no longer is aligned underneath the rest of the leg, rotation and deformity of the forefoot, tightening of the heel cord, development of arthritis, and deformity of the ankle joint. At certain stages of this disorder, pain may shift from the inside to the outside aspect of the ankle as the heel shifts outward and structures are pinched laterally. Diagnosis First, both feet should be examined with the patient standing and the entire lower extremity visible. The foot should be inspected from above as well as from behind the patient, as valgus angulation of the hindfoot is best appreciated when the foot is viewed from behind. Johnson described the so-called more-toes sign: with more advanced deformity and abduction of the forefoot, more of the lateral toes become visible when the foot is viewed from behind. The single-limb heel-rise test is an excellent determinant of the function of the posterior tibial tendon. The patient is asked to attempt to rise onto the ball of one foot while the other foot is suspended off the floor. Under normal circumstances, the posterior tibial muscle, which inverts and stabilizes the hindfoot, is activated as the patient begins to rise onto the forefoot. The gastrocnemius-soleus muscle group then elevates the calcaneus, and the heel-rise is accomplished. 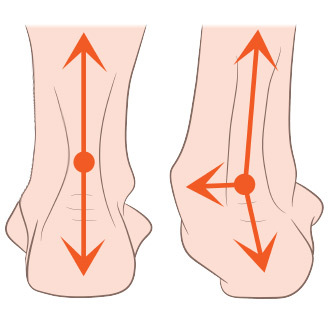 With dysfunction of the posterior tibial tendon, however, inversion of the heel is weak, and either the heel remains in valgus or the patient is unable to rise onto the forefoot. If the patient can do a single-limb heel-rise, the limb may be stressed further by asking the patient to perform this maneuver repetitively. Non surgical Treatment Because of the progressive nature of PTTD, early treatment is advised. If treated early enough, your symptoms may resolve without the need for surgery and progression of your condition can be arrested. In contrast, untreated PTTD could leave you with an extremely flat foot, painful arthritis in the foot and ankle, and increasing limitations on walking, running, or other activities. In many cases of PTTD, treatment can begin with non-surgical approaches that may include. Orthotic devices or bracing. To give your arch the support it needs, your foot and ankle surgeon may provide you with an ankle brace or a custom orthotic device that fits into the shoe. Immobilization. Sometimes a short-leg cast or boot is worn to immobilize the foot and allow the tendon to heal, or you may need to completely avoid all weight-bearing for a while. Physical therapy. Ultrasound therapy and exercises may help rehabilitate the tendon and muscle following immobilization. Medications. Nonsteroidal anti-inflammatory drugs (NSAIDs), such as ibuprofen, help reduce the pain and inflammation. Shoe modifications. Your foot and ankle surgeon may advise changes to make with your shoes and may provide special inserts designed to improve arch support. Surgical Treatment Types of surgery your orthopaedist may discuss with you include arthrodesis, or welding (fusing) one or more of the bones in the foot/ankle together. Osteotomy, or cutting and reshaping a bone to correct alignment. Excision, or removing a bone or bone spur. Synovectomy, or cleaning the sheath covering a tendon. Tendon transfer, or using a piece of one tendon to lengthen or replace another. Having flat feet is a serious matter. If you are experiencing foot pain and think it may be related to flat feet, talk to your orthopaedist.